A future of crumbling roads and bridges, trillions of dollars in investment needs, a national economy that requires modern infrastructure to remain competitive globally and the inevitable transition to 'Smart Cities'. These are all factors that create the highest stakes confronting federal, state and municipal departments of transportation (DOTs) since World War II. This is the first in a series of blog posts in which we address the opportunities and potential pitfalls faced by each party in the infrastructure value chain as a result of the unique circumstances in place today. We start at the top of the chain with the project owners: DOTs. DOTs will set the table for the next stage of US long-term growth or they will be responsible for its decline. The American Society of Civil Engineers graded our national infrastructure as a D+ in 2017. $4.6 trillion of investment will be required by 2025 to bring our infrastructure up to par. Failing to act will cost businesses $7 trillion and 2.5 million jobs by 2025. Smart grid projects have created nearly $7 billion in total economic output, 50,000 jobs, and over $1 billion in government tax revenue. Smart Cities can create a powerful economic transformation; for instance, minimizing the 5.5 billion hours each hear that Americans sit in traffic at a cost of $120 billion. 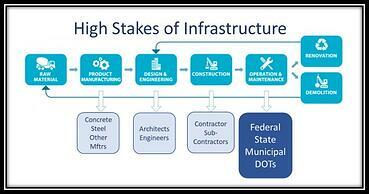 DOTs will be well served by embracing these as they lead in the high stakes infrastructure challenge facing us today. Fortunately, many are doing so and the Federal Highway Administration is encouraging this under Every Day Counts, an initiative which provides financial support for exploring innovative practices. We at Idencia are proud to be working with MassDOT on one of these.